Hibernian manager Alan Stubbs says knocking Aberdeen out of the Scottish League Cup is a great confident boost for his side. Goals in the last 10 minutes from Jason Cummings and Dominique Malonga ended Aberdeen's 100% winning start to the domestic season. "It's a bit confidence booster for the players. It's a great result for us," Stubbs told BBC Scotland. "They're a really good team, they've got some fantastic players." 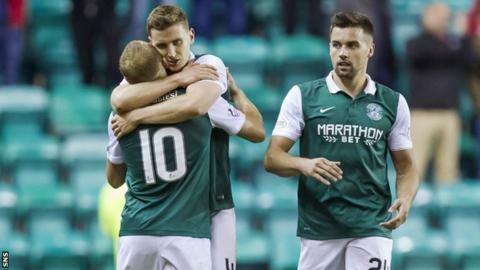 Hibernian go into Monday's quarter-final draw and could meet Edinburgh rivals Hearts. Stubbs said: "As long as we are home, I'll take anybody at home because it's great when you win here. It's a great place. "The atmosphere was great in the second half and we're now looking forward to the draw on Monday. "I think early on, especially in the first half, you saw two good teams cancelling each other out and there wasn't really an awful lot happening. "Second half started to open up a little bit and we scored two not bad goals to win the game. "Jason had run his course, he was starting to cramp up a little bit and we've obviously got a more important game on Saturday against St Mirren and we want to get the lads recovered. "That's what having a good squad is all about, you bring players off and put some on who can do just as good a job and tonight the subs worked. "I thought it was a really close game but I think over we maybe just shaded it." Aberdeen manager Derek McInnes saw first-half injuries to Willo Flood and Graeme Shinnie disrupt his plans at Easter Road. "Hibs showed that wee bit of quality in the final third that gets them through the tie, I think Alan's assessment of the game is right," said McInnes. "I thought Hibs' first half had a bit more of the play than I would have wanted. I thought second half we controlled the game without being overly threatening. "Hibs played a system we've played ourselves in Europe a couple of times - they condensed the middle of the park, they went with the extra defender at back and we had to try and come up with the answers when we were a left-sided player short when Shinnie went off and [we were] already without Jonny Hayes. "We weren't as well balanced as we normally are as a team and a couple enforced changes don't help matters. "That said, I think Hibs deserved it. They found an answer, that bit of quality and the way the game was going that first goal was always going to be important."